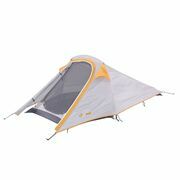 The Osprey Stratos 50 is ideal for overnights or multi-day excursions when you don’t plan to bring the kitchen sink. However, with two loading options—either from the top or via the large zippered front panel—you could bring the sink if you really wanted. No matter what you choose to pack inside, the Airspeed™ Suspension and spacer mesh harness and hipbelt keep your load stable and comfortable no matter where you roam. Two side pockets with InsideOut™ mesh compression bolster stability and provide easy access storage. And there are also two zippered pockets on the hipbelt, perfectly sized to keep your phone and trail snacks close at hand. Additional features include removable sleeping pad straps for varied external attachment options, an ice axe attachment loop for high alpine excursions, and an integrated raincover in case you get caught out.